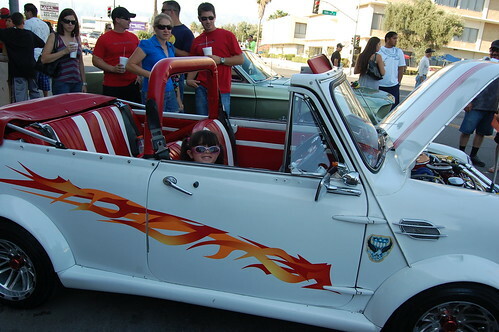 On Saturday, after sleeping in until the early afternoon, we headed out to San Bernardino to the annual Route 66 car show. This has become a annual family outing for us. I can remember the first time we took The Phi she was 4 months old and in a Baby Bjorn carrier. The Phi has a always had a love of cars. This kid has dozens and dozens of hot wheels. 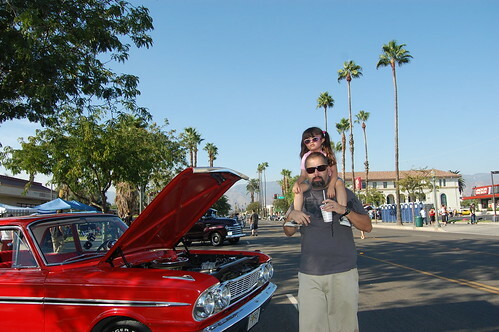 PR Dad also likes cars, and even I have a soft spot for lowriders, so it makes Route 66 a good day for all of us. Teaching The Phi how to spot a good paint job. 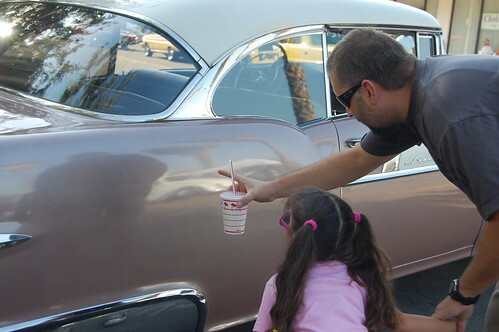 Classic cars, palm trees and an In and Out cup. Could we be any more California locales? My Mini-me in a mini cooper. 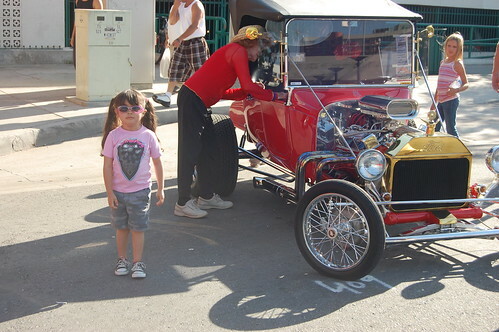 She asked me to take her picture next to this car. The best part of the car show was running into Grandpa Bobo (PR Dad's Dad!) 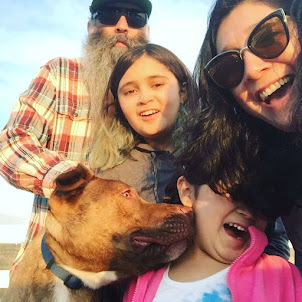 and his crew. We got to see some pin-stripers in action. Very cool. 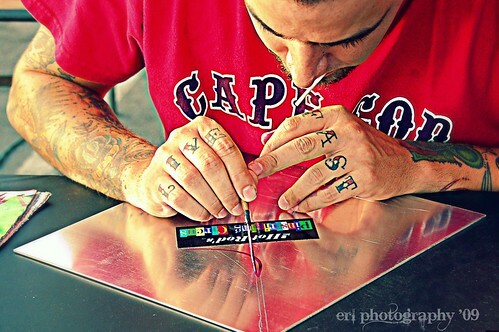 I had to snap this photo because I loved how you could see his knuckle "LIVE FAST" tattoos while he worked. 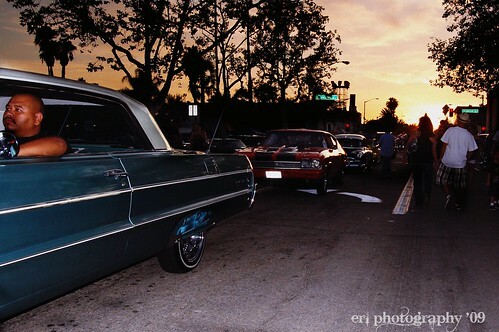 The sun sets as the lowriders cruise the blvd. 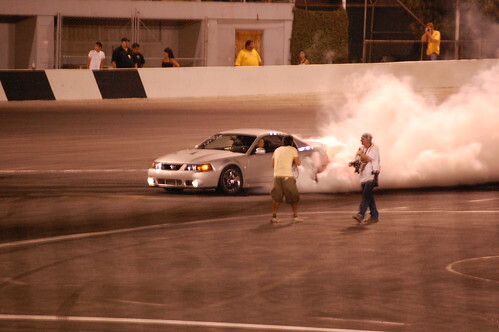 After we wandered the car show we headed over to the race track for a Burn Out / Drifting competition. Yes the smell of burnt rubber is awful, but The Phi and PR Dad really dig this kind of stuff. It was fun, except for the idiot sitting behind us yelling profanities every 5 seconds. I hope one day I run into him and he has a kid and I am just going to scream curse words in his kids face. See how he likes it. Seriously this was a fat loser dude, trying to impress the people he was with and instead was I am sure embarrassing them, and his Momma for raising such a douche bag. ANYWAYS.... it was a good day, despite my cold, I can always have a good time with my husband and our Phi. I've always wanted to go to this. I'm like PR Dad, love cars. I grew up within hearing distance of Lions Drag Strip. Maybe next year. those are awesome photos. i feel like i am right there!